It felt like a Bank Holiday, even though it was one of the two weekends in May that wasn’t – lousy traffic (wherever you were heading), surprisingly hot sunny weather, and a relaxed holiday mood in the paddock (except for Hamish McNinch, who was hot and bothered with too many hats on!). The tone of the meeting may also have been influenced by the Royal Wedding, in honour of which the bunting was out and Annie Boursot had baked a magnificent tiered cake complete with royal icing and decorative white roses (I’m not telling you who tried to eat the real rosebuds rather than the sugar ones … eh up petal, should have gone to Specsavers!). And so, to the racing. A grid of 29 cars lined up for the Bill Philips Trophy Race behind Eddie Williams on Pole. A last minute substitution saw Eddie driving an alternative Nash from Gillett’s stable, the very historic, genuine Frazer Nash TT, which Charlie insisted was much slower than the SS … not that we noticed! An exuberant start saw the first 4 cars, Williams, Kneller, Chilcott and Mann, hurtle towards Old Hall Corner, none giving ground (so braking too late) and each taking an excursion onto the grass (without incident) before resuming their race on track. Eddie Williams (Frazer Nash TT) pulled away, pursued by Christopher Mann in the Alfa Romeo Monza, who had relegated Tim Kneller (Riley Sprite TT rep) to 3rd place. Chris Chilcott in the Frazer Nash Fast Tourer dropped back, clearly in trouble, and was overtaken by about half the field before retiring on Lap 4, overheating due to a cracked block. As the race progressed, the two frontrunners stretched out a significant lead, Eddie driving extraordinarily well in the ‘slow’ TT Nash to stay ahead of Mann’s Monza. On the final sector of the last lap, Christopher closed the gap at Lodge, catapulted out of Deer Leap and blasted past Williams about 40 yards before the line, stealing the win by a margin of 0.42 seconds. 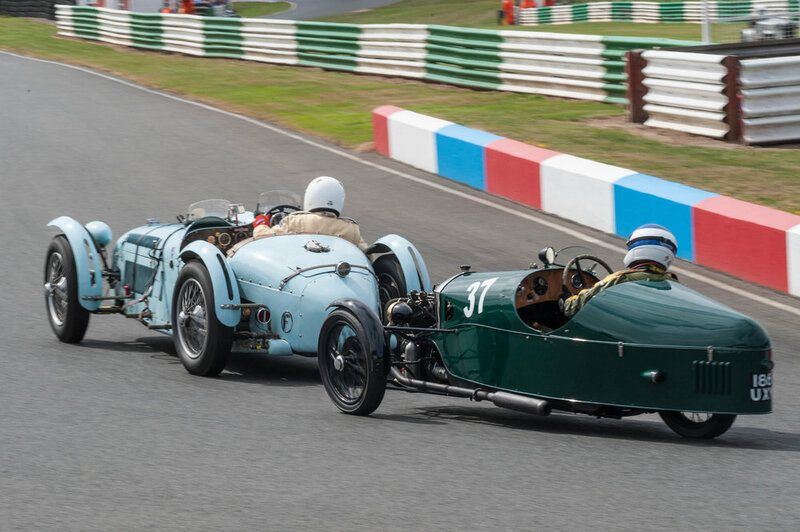 Midfield, John Briggs (Aston Martin Ulster) and John Guyatt (Talbot Lago T150C), both of whom had been cautious in qualifying, had a close race squeezing past Hamish Monro (Frazer Nash SS) and Ian Standing (Riley Brooklands), who were also jockeying for supremacy throughout. After swapping places a couple of times, the Talbot Lago finally swung past the Aston on the home straight, finishing 13th, a mere ⅓ of a second ahead of Briggs in 14th with Monro a couple of seconds behind in 15th, half a second ahead of Standing in 16th. Barry Foster (MG Montlhery), also below par in practice, forged ahead in the race, overtaking John Reeve and Clive Temple (both in Riley Brooklands), and then getting past the faster High Chassis Invicta of Ned Harris to finish 3 seconds behind Steven Pryke in the Frazer Nash TT rep (17th) with Ned 2 seconds behind in 19th and Clive a couple of seconds behind him in 20th. John Reeve (Riley Brooklands), who unfortunately had to pull off at Silverstone when his (new) oil filter split, seemed to be struggling for performance at Oulton, losing his contest with Andrew Morland’s MG L1 Tourer by 3 seconds. Norman Pemberton (Talbot 95/105), staging a comeback after a season’s absence, was making good progress until his door flew open allowing Tim Wadsworth (Lagonda 2 litre Tourer) to pip him to the post with one second in hand (Norman had rather more in his hands – a steering wheel in one and a passenger door in the other!). Oulton Park also saw the welcome return of Sarah Foster in the MG TB (after a year out, devoted to duller things); she had a good race with Annie Boursot, eventually beating her by just 1½ seconds. The second ODM race, assembled at short notice, saw one of the main contenders, Eddie Williams, scratch (Gillett’s hastily prepared TT Nash had certainly been put through its paces in the Bill Philips), but Anthony Fenwick-Wilson’s Railton, a non-starter in Race 1 due to overheating (that’s overheating with an ‘h’! ), did join us for Race 2. Chris Chilcott, having done what he could to overcome his engine’s frailties between races, also decided to give it a go and take up his spot on the grid. Yet again, there was a rather exuberant start, with Tim Kneller on pole almost jumping the lights in his Riley Sprite and an over-enthusiastic Tom Waterfield, racing with us for the first time in Simon Blakeney-Edwards’ Frazer Nash SS, gunning it a split second too soon. Tom passed Tim and flew off into the lead with Kneller’s Riley chasing hard. Andrew Mitchell (HRG) and Mark Brett (Ballamy Ford) followed in 3rd and 4th, both a little off-song, and slightly off the pace, despite inter-race fettling (…is it fuelling? is it cooling? … what on earth is it?!). As Waterfield and Kneller pulled away from the pack, Waterfield’s Nash gradually extended its lead over the Riley, gaining a 6 second advantage by the end of the race. However, this was 4 seconds too few to overcome his 10 second jump start penalty, so Tim Kneller took 1st with Tom Waterfield 2nd … but Tim graciously handed an elated Tommy the winner’s champagne on the podium. There is no doubt that, bar his start-line misdemeanor (lesson learned! ), Tommy drove extremely well, recording the fastest lap of the race, 5 hundredths of a second faster than Eddie Williams’s Best Lap in the first race! Simon Blakeney-Edwards, who had raced the same Frazer Nash Super Sport in the first race, complained of feeling old and slow ( … but it is hardly surprising that Simon should be rather more circumspect, when he has invested so much time and effort into rebuilding the car). What a glorious start to the ODM’s 10th Season! Silverstone was sunny, sociable and host to some sensational motorsport. With two excellent grids, one on each day, it was a pleasure to welcome a number of new European competitors as well as an impressive contingent of Aston Martins among the 18 marques represented. 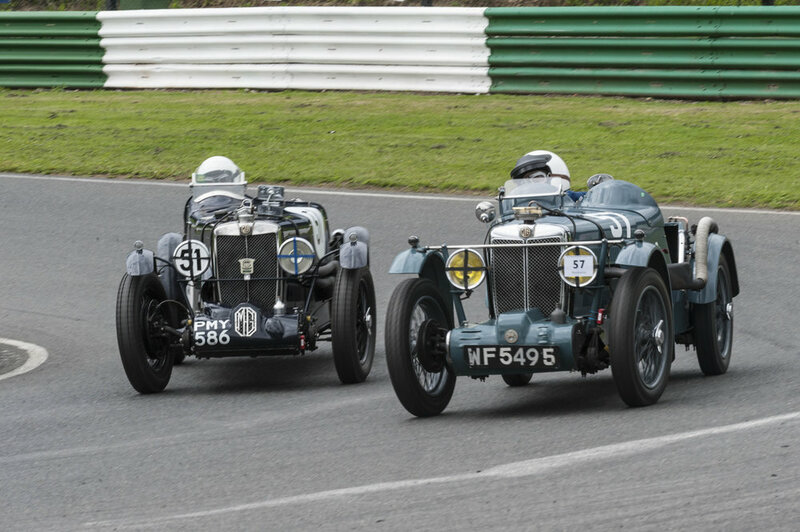 Much to the delight of ‘Le Patron’, Saturday’s Fox and Nichol Trophy Race roared off the line led by two Talbot Lagos. (John Guyatt, sadly, was unable to complete the quartet of Lagos in the field, having lost all drive just prior to practice). As the lights turned green, Marcus Black in the T23 snatched the lead from Pole-man Richard Pilkington (T26 SS), but Richard retook him on lap 2 and, harried by Marcus all the while, retained first position to win the race with a slim margin. Conspicuous to the spectator was the difference in the two driving styles (perhaps also occasioned by the comparative capabilities of the two cars? ), with Richard appearing to be calmly enjoying a Saturday sortie and Marcus sawing at the wheel to extract every last ounce of performance. Although the Fox & Nichol Trophy frequently adorns Pilkington’s mantelpiece, it was a well-deserved win and a happy return to Silverstone for Richard after his tribulations last season. Chris Chilcott’s Frazer Nash lived up to its name (Fast Tourer) and hurtled round to finish a comfortable 3rd despite being outpaced by the two cars behind him on best lap times. 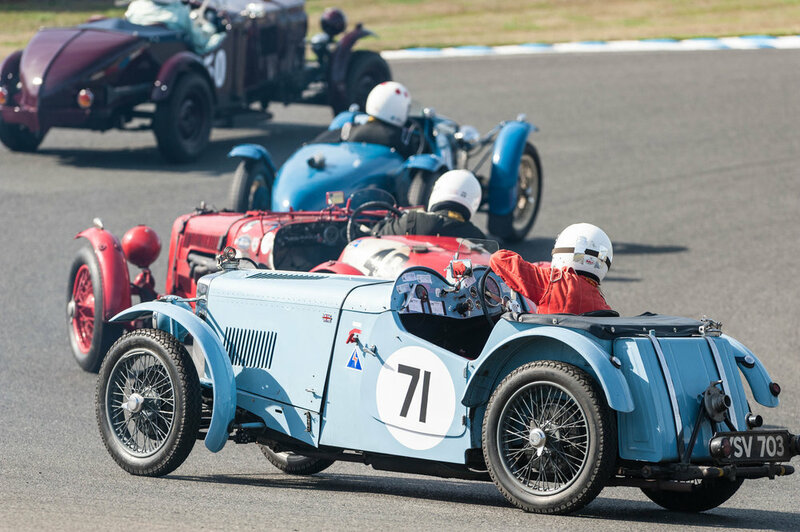 The evenly matched Delahaye of Ross Keeling and HRG of Andrew Mitchell ran a close race, finishing 4th and 5th. Chris Ball ran very well to finish 6th in the Invicta S Type, challenged throughout by the 1½ litre Aston Martin Ulster in the exceptionally adept hands of Richard Bradley, who finished just 1½ seconds adrift in 7th. (Despite being a Le Mans Team works driver, Richard apparently really enjoys racing his father’s old Aston with us amateurs because it is so hands-on; rather than relying on modern telemetry, he has to feel the car, read the road and make entirely independent judgements – quite a different challenge and a lot of fun, he says!) Bradley finished 8 seconds ahead of the two following Astons of John Briggs (8th) and David Ozanne (9th). Further down the field, Simon Edwards (Morgan Super Aero) lead from Ian Standing (Riley Brooklands) and Christopher Lunn (Talbot 105) and the three of them had a great race, finishing seconds apart in 10th, 11th & 12th. Simon King (Morgan 4/4 Le Mans) got past Clive Temple’s Riley Brooklands and, as they both diced with Andrew Baker in his Brooklands, came in 16th behind Andrew at 15th, with Clive close behind. Simon Jackson (MG PB) found an additional 3 seconds a lap on his practice times to advance 5 places and parry with fellow MG driver Duncan Potter in the Midget; they finished less than ½ second apart in 19th & 20th with Chris Guest (4½ litre Bentley), also in the mix, coming in close behind in 21st. Geoffrey Delaney (Lea Francis Hyper) overtook Alex Pilkington’s 6c Alfa Romeo and both made good progress up the field, Delaney extending his lead to come within sight of Guest’s Bentley and Alex having a close race with David Lamb (Riley Brooklands) hard on her heels. Trevor Swete (Invicta S Type) started from the rear of the grid after trouble in practice, but worked his way up from 31st to 13th place at the flag, while Chris Cadman (MG Midget) had to start from the pit lane due to assembly issues, but sadly had no chance of catching the field. Max Sowerby on his debut outing in the 3 litre Talbot Lago had an eventful day: he overheated badly in practice and, not being a mechanic, enlisted the assistance of our wonderful marquee provider, Jerome Fack, (and others) to rebuild his water pump with spares rapidly garnered from John Guyatt’s workshop (fortunately relatively nearby!) in time for the race. He ran well, circulating in the mêlée behind the first three Astons, until the final lap when a horrible noise and power loss left him limping for the line in 18th. Despite the damage being terminal (some butchers have attacked the engine of late!) Max was still smiling: elated at finishing his first race, delighted by the helpfulness of our gang, and thrilled by the whole ODM experience. While Saturday’s race was dominated by Talbot Lagos, Sunday’s race was dominated by Nashes. Eddie Williams, driving Gillett’s very quick Frazer Nash SS, led the field away from pole and Chris Chilcott, starting from the third row in his Fast Tourer, quickly passed Monro, Kneller and Brett to chase down the leader. Williams was well in command until he missed a gear, giving Chilcott a chance. They had a great race to the finish, Williams the undoubted victor 3 seconds ahead of Chilcott. Mark Brett (Ballamy Ford), who had been absent on Saturday, stole a march on Tim Kneller (Riley TT Sprite rep) to finish 3rd with Tim (who had run out of petrol in Saturday’s race) in 4th. Richard Bradley (Aston Martin Ulster) ran another stellar race, tussling with Hamish Monro (Frazer Nash SS) who had started ahead of him, bettering his Saturday race times and beating Monro to take 5th. Trevor Swete (Invicta S Type), having less traffic to contend with than on Saturday, also improved his race times to gain 7th place. David Ozanne (Aston Martin Ulster) made up ground after a slow qualifying, overtaking Guyatt and Standing to finish 8th ahead of Simon Edwards (Morgan Aero SS), as he had on Saturday. John Guyatt at the helm of his other Talbot Lago T150C (this one having forward motion!) 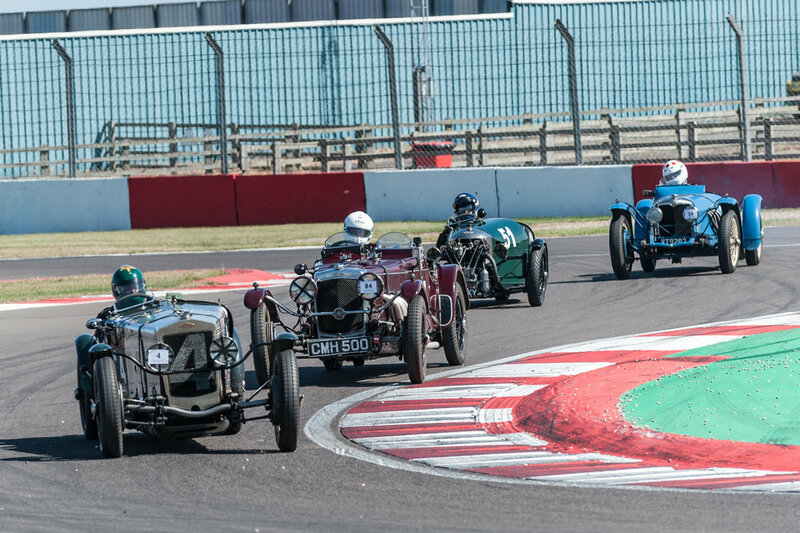 had a great race with Ian Standing in the Riley Brooklands, John powering ahead down the straights and Ian seizing the advantage through the corners. On the last lap, Ian went round the outside at Luffield, holding enough speed to pass the chequered flag before John could get level with him, or so they both thought, until they saw the race results … John 5 hundredths of a second ahead in 10th place! (Could it be that the timing line is further down the start-finish straight than either expected?). Three further epic battles played out down the field: Barry Foster (MG Montlhery) and Andrew Baker (Riley Brooklands) fighting for 14th place – Barry the victor by 3 tenths of a second; just behind them, Duncan Potter (MG Midget) and Clive Temple (Riley Brooklands) fighting for 16th – Clive’s accidental selection of 1st gear on the straight set him back enough to lose the contest; and finally, David Cooksey in the third MG Montlhery vying for 19th position with Marian Stoch in his Aston Martin 15/98 – Marian learning the circuit fast on his first visit from Poland but not quite catching the seasoned driver, David. What great racing, from the front of the field to the back! Commiserations to all those who suffered disappointment due to mechanical misfortunes great and small, and congratulations to all those ‘Mechanics’ who succeeded in getting their cars back on the track to play with us. As we well know, the task does not get any easier as spares and skills become scarcer over time. Shortly after the lunchtime Classic Cavalcade, our grid formed up to open the day’s racing with Frazer Nashes dominating the front row (Patrick Blakeney-Edwards on pole alongside Eddie Williams in Charlie Gillett’s very quick SS). Tim Kneller, who had qualified extremely well in the wet, was lined up behind them in the Riley Sprite along with Mark Gillies, driving the Aston Martin Monoposto (currently bodied as a 2-seater sports car). On the last corner of Lap 1, Trevor Swete appeared to suffer an excess of enthusiasm, careering off across the wet grass before thumping broadside into the tyre wall. The safety car was deployed for a couple of laps while the Invicta was retrieved, during which time Eddie Williams came in for his 10 second stop-start penalty and the field bunched up. On the restart, Mark Gillies incurred a 30 second penalty, much to his annoyance, for accelerating before the Start Line Green Flag. (He maintains that he was duped by some tactical driving!) However, it was a long race (20 minutes), so plenty of full-speed running time still remained. 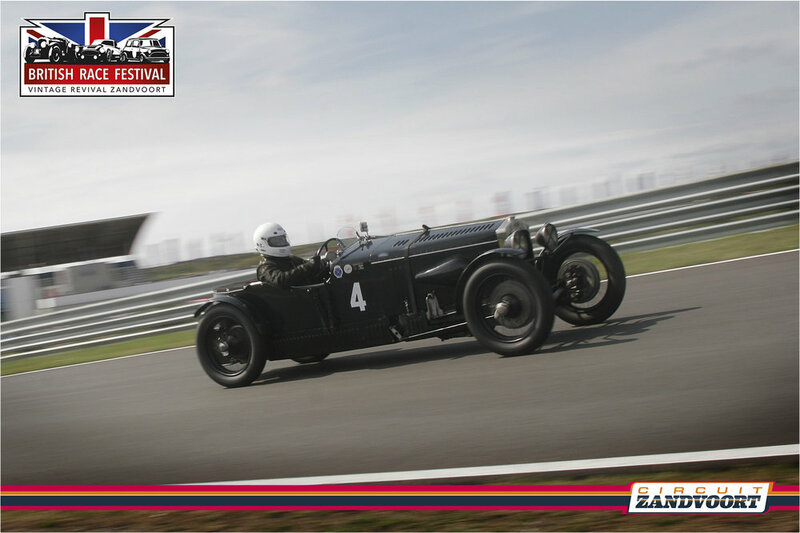 Lap by lap, Patrick Blakeney-Edwards in the Frazer Nash SS extended his lead to take the chequered flag. Eddie Williams, trying hard to make up for lost time, came in 5sec behind in 2nd place. Some distance behind, Gillies finished in 3rd position, but was demoted to 5th place with the addition of his time penalty, giving Tim Kneller 3rd place on the podium. Sue Darbyshire ran a remarkably good race in the Morgan Super Aero, finishing in 4th just 5 seconds behind Kneller, despite the fact that Tim’s Riley Sprite had a top speed advantage worth about 2½ seconds a lap … which goes to demonstrate the value of consistency! 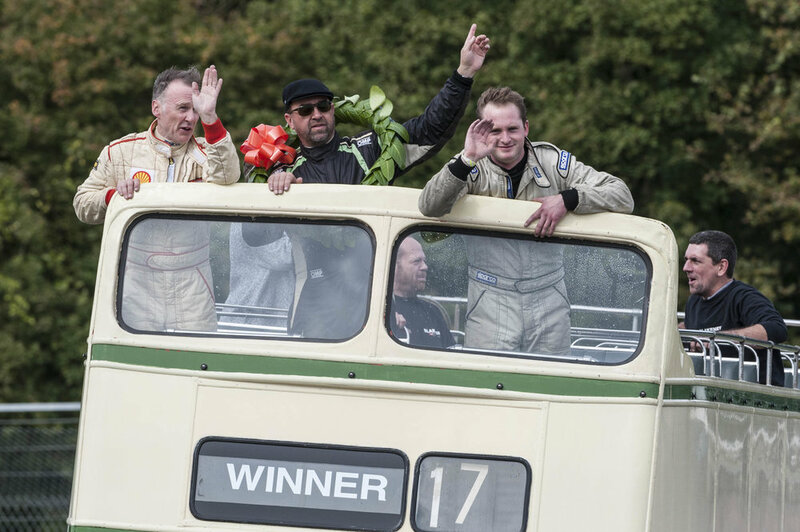 Simon Blakeney-Edwards was delighted to finish 8th, a couple of seconds behind Lewis’s more powerful Alvis Special and a smidgeon ahead of Bradley’s Aston. Yet again, Richard Bradley, clearly a very talented young driver, ran an outstanding race in his father’s standard 1500cc Ulster, seriously outpacing the other two Aston Martin Ulsters to finish 9th. Christopher Mann put in a strong performance in the Alfa Romeo RL Targo Florio to take 11th place, apparently no worse for wear after his ordeal (involving banditry and battery) just prior to departure for Castle Combe and a misfiring magneto on the drive down (replaced in the wee small hours, before practice). Not far behind the Alfa, the two Aston Martin Ulsters of David Ozanne and John Briggs had a great race, finishing within half a second of each other, David’s 1900cc engine just giving him the edge in the end. Then came John Polson in the Talbot AV 105, who overtook Guyatt’s struggling Talbot Lago and held his position to finish a couple of seconds ahead, while Barry Foster, determinedly dicing with the larger Lago in his little MG Montlhery, was eventually outgunned on the finishing straight. 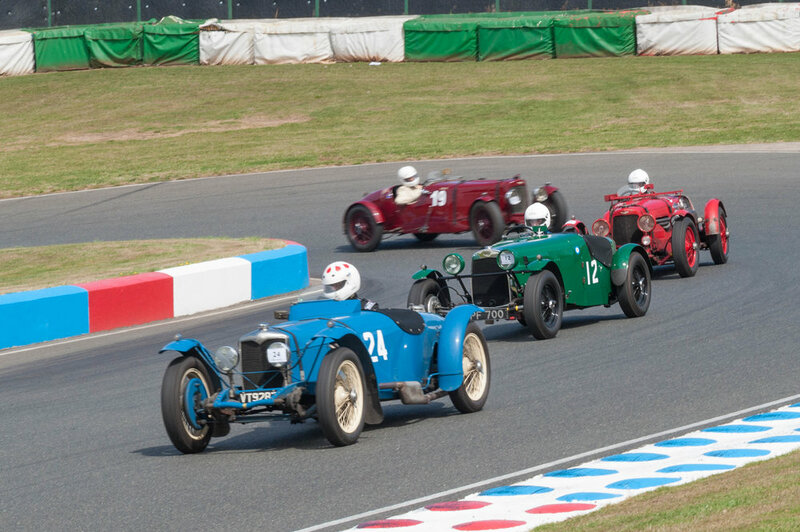 Behind this trio, there were a series of duels: Mac Hulbert (Alvis Silver Eagle) finished a couple of seconds ahead of David Cooksey in the MG Montlhery; Roger Tushingham in the K3-lookalike MG N type beat Malcolm Barrington (Frazer Nash TT rep) by just 0.3 seconds; Yushan Ng (Frazer Nash Ganger Hartley Spl) came in less than 2 seconds ahead of Stephen Curtis (driving the Talbot 105 in his swansong race – we’ve enjoyed having you with us, Stephen! ); and Tim Wadsworth (2 litre Lagonda) crossed the line about 20 metres ahead of Mark Reece (MG J4). Only Hamish McNinch in his pale blue MG PA circulated in solitary splendour! Our thanks and congratulations go to everyone (including the invited specials) for a good clean race and an enjoyable day in Wiltshire. With autumn now firmly established and the race season run, it’s time (for some of us, at least!) to ferret out those gremlins. There is much to look forward to in next year’s Race Calendar, and we would all like to enjoy it to the full. In motor-racing, as in life, there is no such thing as ‘a sure thing’. In the same way that a sudden downpour at lunchtime dashed all hopes of a dry racetrack after a fine bright morning, so Andrew Mitchell’s seemingly unassailable lead on the ODM Scoreboard was scuppered by engine failure in practice. With notable absences among other Award contenders (Tim Kneller on a 3-line whip for Carol’s birthday and Mark Brett’s car requiring major engineering after his Mallory mishap), the way was wide open for surprise wins throughout the Classes. The 2017 Results would be decided at Snetterton … and the race was on! Richard Bradley (Aston Martin Ulster) was in pole position after an aston-ishingly quick practice but retired with gearbox problems on the warm-up lap, leaving Mike Preston to lead the field away in his Type 35B Bugatti. Sue Darbyshire, starting from the 2nd row of the grid in her Morgan Super Aero, soon overtook Mike Preston, hotly pursued by Iain Stewart’s Super Aero, rapidly advancing from the 4th row. The two Morgans kept the Bugatti firmly behind them as they battled for supremacy; Sue retained the lead until the latter stages of the race but Iain finally prevailed, taking the chequered flag by a smidgen – just 0.19 seconds. Mike Preston, finding no way past the three wheelers, finished 3rd after recording the fastest lap of the race on lap 7. Behind the leaders, the action was no less exciting. 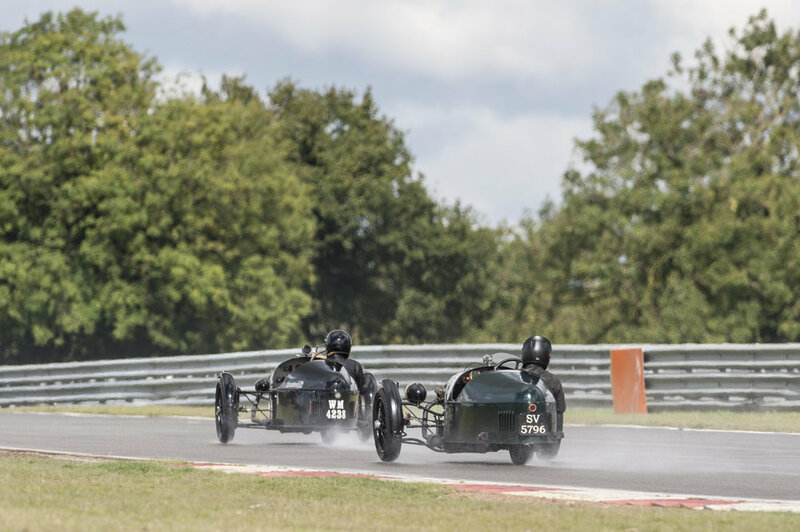 Simon Edwards in the 1089cc Morgan had qualified extremely well and, starting from the 2nd row, enjoyed a close race with Simon Blakeney-Edwards and Trevor Swete. However the superior power of Simon’s Frazer Nash SS and the S-Type Invicta ultimately won the day, so the Morgan finished in 6th place behind them. The finishing positions of all three proved crucial, earning each of them prizes by close of play. John Guyatt (Talbot Lago T150) gained two places at the start, briefly getting ahead of Blakeney-Edward’s Nash and Swete’s Invicta, only to lose them again as he struggled for grip in the corners. 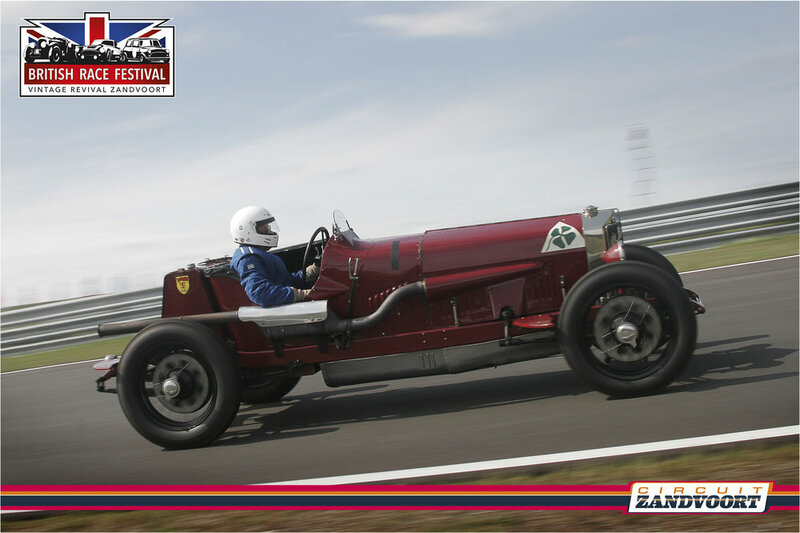 As they pulled away, Christopher Mann’s Alfa Romeo RL Targo Florio powered past him displaying no such handling difficulties, an impressive performance (especially considering that it is a 1923 car!) which earned him 7th place at the finish. 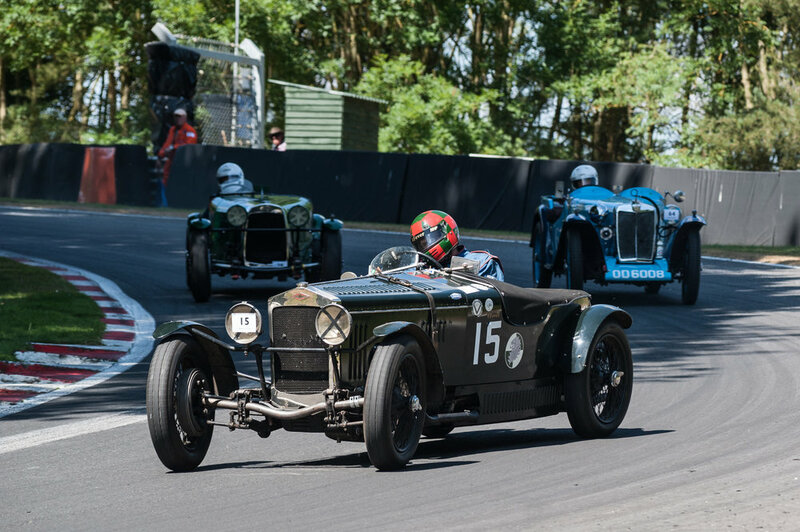 Guyatt continued to steam down the straights and tiptoe round the tricky bits, alternately losing and regaining places with both David Johnson’s Frazer Nash and John Polson’s Talbot 105, before finally conceding defeat to David’s Nash in the closing laps. Stephen Pryke (Frazer Nash TT rep) finished in 11th position, hard on the heels of John Polson in 10th. There was a tremendous race between the next three cars, all in the under 1100cc Class: Barry Foster in his ‘thank-goodness-he’s-got-it-running-at-last’ MG Montlhery, Andrew Baker in the fastest (on this occasion!) of the 5 Riley Brooklands and Duncan Potter in his ‘I-can’t-imagine-how he-fits-in-it’ MG Midget. In the end, Barry succeeded in finishing just 1.73 seconds ahead of Andrew, who beat Duncan by the merest fraction – once again 0.19 seconds. Ian Standing had been circulating at the rear of this group until an unexpected spin set him back behind fellow Brooklands driver John Reeve (yes, it WAS greasy out there; it wasn’t just John Guyatt who noticed!). Ian spent the remainder of the race chasing Reeve down, eventually passing him on the final corner, only to lose out at the finishing line … all bar a few feet, or 0.11 seconds according to the transponders. All in all, Snetterton provided a thrilling finish to an eventful season. The race result catapulted the Morgans to prominence: Iain Stewart winning this round on his ODM debut; Sue Darbyshire finishing a very close 2nd, good enough to leapfrog to equal 2nd in Class II (with Tim Kneller, Riley Sprite rep) and joint 3rd Overall in the 2017 ODM Challenge. Simon Edwards in the 1089cc Morgan achieved a remarkable 6th place in the Snetterton race ahead of all his classmates, earning himself not only a 1st Class Award among the Under 1100ccs but the ODM Trophy for the Overall Winner too! In Class I, John Reeve’s consistent performance in the Riley Brooklands rewarded him with a 2nd Class Award and Duncan Potter, last year’s Trophy Winner, did well to complete a total mid-season MG rebuild and still take the 3rd Class Award (‘mechanic’ points very definitely earned!). In Class III (1501cc – 3000cc), John Polson (Talbot AV 105) gathered just enough points at Snetterton to equal David Ozanne’s total in the Aston Martin Ulster and share the top spot, 1st in Class; Tim Wadsworth (Lagonda 2 Litre) gained a creditable 2nd Class Award through sheer perseverance; and Nick Rossi (Alfa Romeo 1750 GS) was 3rd in Class. In Class IV (Over 3 litre), Trevor Swete’s strong race result at Snetterton in the Invicta S Type enabled him to pip Mark Brett to the post and win the 1st Class Award ahead of the Ballamy Ford, 2nd in Class. 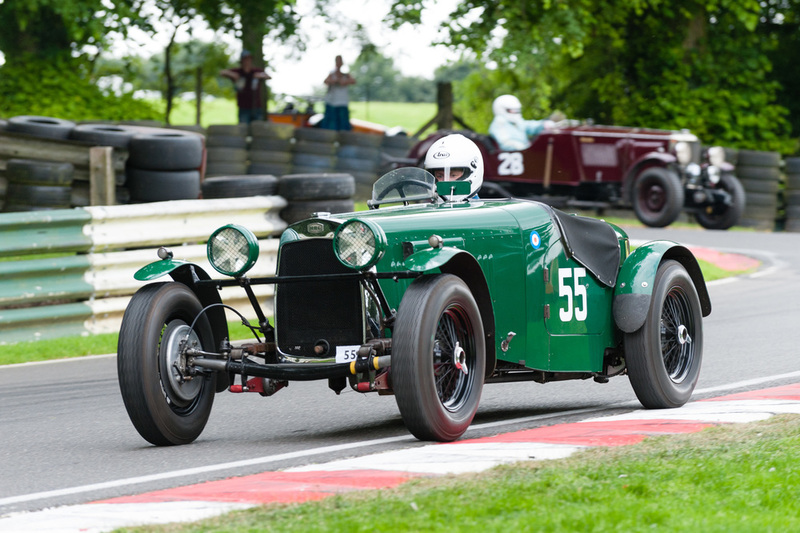 Mark Butterworth (Lagonda V12) and Richard Pilkington (Talbot Lago T26) shared the 3rd Class Award. Our grateful thanks go to Tom Hardman for providing the splendid prizes for the Class winners … and for hanging on at Snetterton in order to present them, even though he was itching to get home to mend his own broken car. As a reminder of times past, Tim Wadsworth brought the programme from his first-ever race meeting … at Mallory Park in May 1960. That’s 57 years ago, in case you are thinking ‘that’s not so long ago; I remember the Sixties!’ Well done, Tim, that’s good going … 57 years of racing! Do I sense some vying for the Golden Oldies Award? On the whole, Mallory was a relaxed and sociable meeting, attended by many old friends and former ODM racers, although competitors encountering miscellaneous inconveniences like detached fixtures and fittings might beg to differ! It was good to see Ross Keeling back in the Delahaye, accompanied by his father Les, on the road to recovery, and an enthusiastic new ODM supporter, his 6-year old daughter. 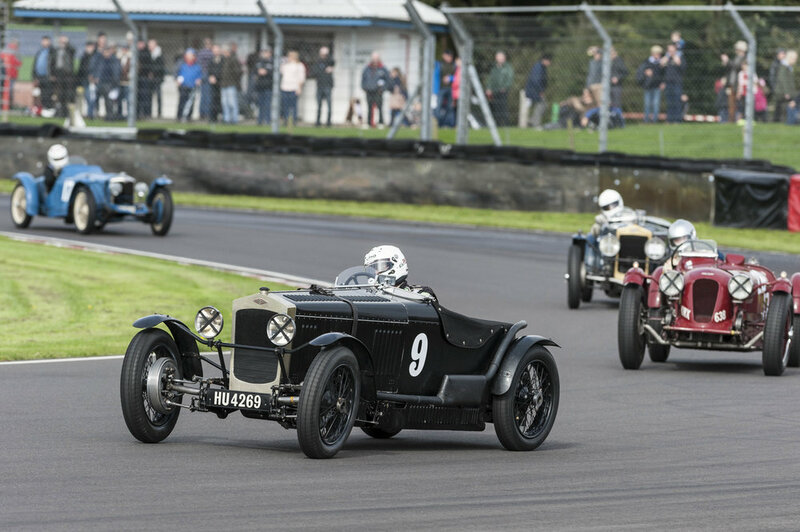 Also, it was a welcome return for Andy Cawley in his very standard 1925 Frazer Nash, by his own admission now universally known as ‘Dougal’s Dad’; Barry Foster, who, unlike at Zandvoort, appeared with a running MG (at last! ); and Norman Pemberton, who practiced but was not permitted to race owing to a footwear infringement. 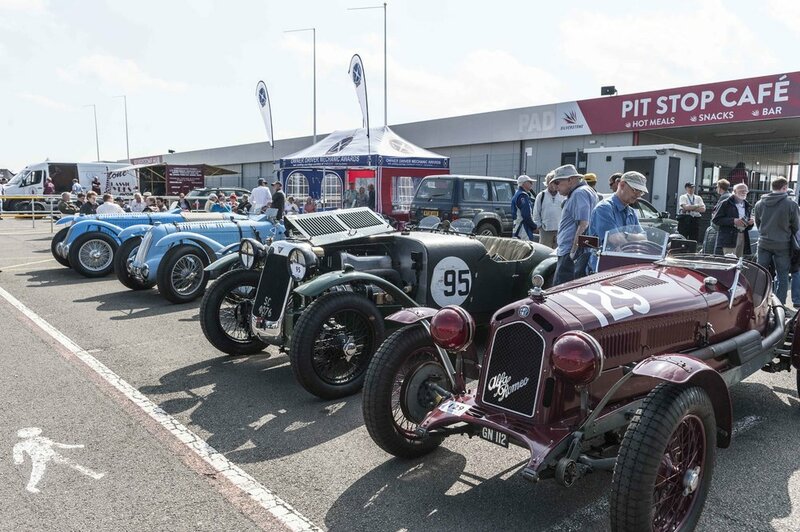 A couple of Aston Martins were also absent owing to a mix-up with dates over an AMOC Meeting clash, so in the event all the reserves made the ODM grid. As the flag dropped, a capacity grid of 30 cars roared off the line, led by Tim Kneller on Pole in his Riley Sprite alongside Mark Brett in the Ballamy Ford, and followed by Sue Darbyshire (Morgan Super Aero) and Jo Blakeney-Edwards (Frazer Nash SS) on the second row. The view from the Paddock Tower was splendid, but it was still difficult to catch all the action as the cars streamed around the track, jostling for position in many hard-fought contests. After his resounding success at Zandvoort, Simon Blakeney-Edwards (Frazer Nash SS) disappointed, succumbing to engine problems on the first lap; his wife Jo, having shown early promise, succumbed similarly a couple of laps later. Shortly afterwards, Ian Standing (Riley Brooklands) retired with a broken throttle linkage, but not before he had put in a flying lap with his ‘cooking’ engine, all the while avoiding any entanglement with a gang of cars including the track-consuming and occasionally grass-cutting Railton of Anthony Fenwick-Wilson. At the front, Tim Kneller retained the lead, steadily threading his way through the back markers with relative ease. Sue Darbyshire hugged his rear corner, ready to capitalize on any error, but, despite recording the fastest lap of the race, got no opportunity to overtake. Half a second behind them, Mark Brett was looking and sounding purposeful in 3rd place when, on lap 9, it became apparent to us, if not to him, that something was amiss with the Ballamy front suspension. Before a warning flag could be deployed, Mark entered the Esses and a rear wheel pulled straight through its studs and flew off into the greenery… fortunately, car and driver were otherwise undamaged. However, the race was then red-flagged, because of the danger posed by the immobilised Ford. As a result, Tim Kneller won the race, although he felt rather let down at not having taken the chequered flag. Just half a second behind him, Sue Darbyshire came in 2nd, pleased to have laid the ghost of Mallory past. Robert Moore was delighted to finish 3rd in Charlie Gillett’s very quick Frazer Nash SS, which he had only driven briefly for the first time on the previous Wednesday. He had been circulating with the two closely matched cars of Hamish Monro (Frazer Nash SS) and Trevor Swete (S Type Invicta) which had drifted into each other at the hairpin on Lap 8, interlocking wheels and ending both their races shortly before the red flag … bruised cars and egos, no doubt, but no misdemeanors apparently. This incident gave John Guyatt a 4th place finish, with which he was well-pleased after starting on the 7th row of the grid (owing to a detached plug lead in practice!). He had stormed past several cars before settling back to enjoy a really close race with Simon Edwards in the smaller-engined Morgan Super Aero. Simon did well to come in 5th ahead of Ross Keeling’s Delahaye 135MS (6th) and David Ozanne’s Aston Martin Ulster (7th), both of which had proved capable of faster lap times. The ensuing 10 cars formed three highly competitive groups, the first brought home by Barry Foster (MG Q Type) in 8th place ahead of David Johnson’s Frazer Nash SS (9th) and Fred Boothby (MG J2) in 10th. Fred was somewhat indignant: ‘all that fuss and noise and misfiring this morning, and then Barry goes and beats me!’ After a troublesome practice, Barry had started the race from the 9th row of the grid, overtaken Andy Baker, who’d made a bad start, and Anthony Fenwick-Wilson before passing Fred and David. In the next group, Duncan Potter, dwarfed by two larger cars in his little MG Midget, did well to finish just half a second behind Mac Hulbert in the Alvis Silver Eagle. The third group comprised three Brooklands Rileys and Simon Jackson’s Cream Cracker: John Reeve prevailed, although Simon recorded a faster best lap. After my last race report from Cadwell Park, I was confident that I had done badly enough to ensure that I wouldn't be invited to do it again. At least, that was my plan. But, as every racing driver knows, confidence is usually misplaced and so I had taken extra precautions to avoid both John and Lesley this year, sacrificing the usual sumptuous lunches and tea provided by Lesley and her excellent team of helpers at Silverstone and Oulton Park. But this plan had failed to take account of the Set 3 excursion to Zandvoort earlier in the month. I found myself in a closed paddock for 2 days where the only source of sustenance (apart from a terrific BBQ provided by the MG gang and their Dutch friends) was Lesley’s tent. I have often wondered how she does it at the race venues in UK, bountiful plates of infinite variety and drinks of every sort being provided throughout. Apparently it involves cooking sessions, during the week preceding the event, that take far longer than the car preparation of even the most fastidious Set 3 driver. But how on earth she and her redoubtable colleague Jackie, managed it in the middle of Holland really is beyond me. Nevertheless I took great care not to engage in any sort of prolonged conversation with Lesley throughout the weekend. And I was sure that I had once more dodged the bullet when all she asked me to do at the end of the meeting was to take some water containers, a table and the ODM flag back to UK (they had travelled out in John Everett’s trailer, but he was now indisposed following his unfortunate accident) and ‘if you can possibly manage it, deliver them to Cadwell’. Knowing that Lesley is fair in sharing out the more onerous ODM duties, I reckoned that this would provide my tick in the box for Cadwell. But just to be sure, I also liaised with the MG Car Club, who had a race meeting at the venue the day before us, and ensured that the space for the ODM marquee was clear in plenty of time. And, as the rain arrived on Saturday evening, I was on hand to make sure she had all she needed (including the table, flag and water containers, which turned out to be weights for holding the tent down) before explaining that I had other responsibilities. ‘Not a problem,’ she replied, ‘I’ve all the help I need and I’m SO grateful to you for getting the stuff here – I don't know what I’d have done without you’. Promising myself that I would re-read the manual on evasion tactics, in the meantime I decided that I would make a greater effort to prepare myself for the race reporter’s duties in the hope of delivering something a little more detailed, descriptive and accurate than on the last occasion. After all, I had the whole of lunchtime on Sunday to prepare and I pride myself in being able to gather information quickly and accurately when required. Who was that chap who said that pride commeth before a fall? Whoever it was has obviously been mechanic for a racing driver. Because I spent the whole time between the end of Practice 6 and the final call to the assembly area for the Set 3 Race fashioning a replacement clutch stop from the contents of my spares box, and those of most of the folk parked in the immediate area, of Annie Boursot’s MG in the paddock. Remember what I said about the average Set 3 competitor’s race preparation? So I missed my assembly area walk. I had no list of runners and riders. And I was wheezing like a punctured barrage balloon as I breathlessly took my seat in the Mountain stand to watch the fun. So what follows may or may not reflect what did or didn't happen over the ensuing 20 minutes…. I actually saw the start this time. And Mitchell’s red HRG was, predictably, in the lead from a Frazer Nash as the field accelerated up the hill and out of my sight. Now my narrative of events was entirely in the hands of the commentary team until such time as the cars would appear rounding the left-hander before the mountain. But there was a failure in the commentary communications and nothing was forthcoming from whoever was stationed at the high end of the course. So little information, indeed, that the remaining commentators at the start line were forced to fall back on what I believe is known in the trade as ‘filling in’. Accordingly, I can tell you of nothing which happened in the race for the next 50 or so seconds. But I can report that it was a Mr Malcolm Dodd’s birthday and we spectators, having nothing better to do, wished him well and many more of them. But we swiftly forgot all about him and his birthday as the leaders appeared, already locked in close combat. Just as the field completed the first lap Williams in his Frazer Nash took the lead from Mitchell, a position he was to hold throughout the ensuing 6 laps. 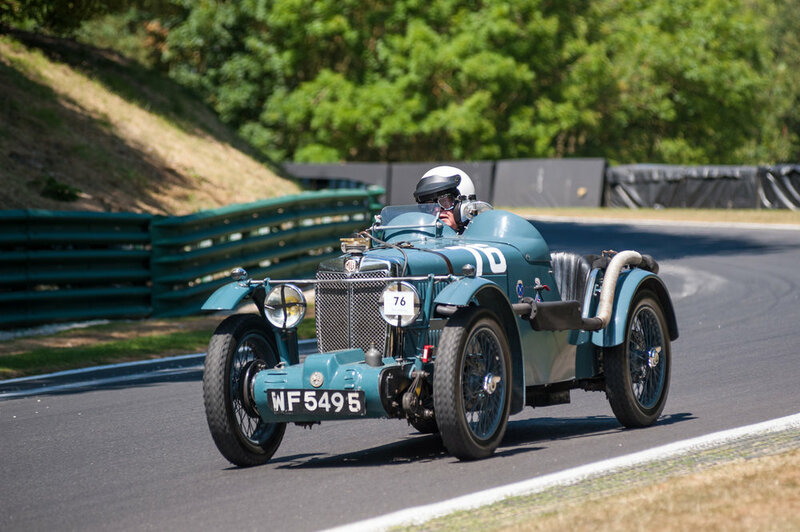 Mark Brett in the Bellamy Fordson (I suspect it is E93W based….) followed and it was a surprise to see John Gillett, (who had travelled all the way from Australia to drive his very correct ex-Bira MG K3) in 4th place closely followed by Sue Derbyshire in the Morgan (what else? 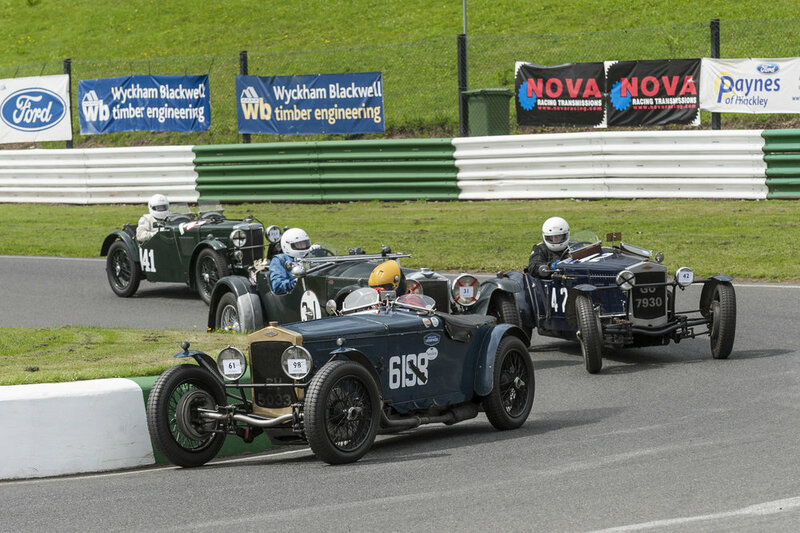 ), Jo Blakeney-Edwards in her Fraser-Nash Super Sports (which is now apparently settling down and beginning to show its true potential), Josh Sharp in his pretty Riley TT Sprite, Richard Lake in the Aston Martin and our patron John Guyatt in the Talbot, all chasing one another with real intent. How lucky we are to have such a variety of cars and drivers in one race. As lap 3 started it was apparent that not all was well as the pace began to slow and some cars began to take rather unusual lines. The reason became clear only later when the drivers realised that a line of oil was appearing all around the track. I’m not here to cast aspersions, but the general opinion was that one of the Frazer Nashes was responsible. Perhaps the owner should consult Lesley before Mallory and find out how many hours she is expecting to dedicate to cooking; then he should add at least one to that figure and allocate the time to trying to ensure it doesn't happen again. It was good to see Freddie Smith out in the Delahaye, particularly because, as a relative newcomer to racing, it was clear that he driving steadily and smoothly and using his mirrors assiduously. As the race progressed he could be seen mixing it with a variety of other cars who will, I predict, not be able to keep up with him when he is able to use the car to its full potential, but for now he is a good example to all novice drivers and a welcome addition to the field. And the fact that he managed to just keep ahead of Ian Standing in his rejuvenated Brooklands Riley is evidence enough that he is learning fast. As the race unfolded, oil notwithstanding, a number of little ‘races within the race’ began to materialise and these kept the crowd well entertained. The aforementioned Smith in the Delahaye was keeping Fred Boothby (who is celebrating his 50th year in motor racing), in his much smaller MG, at bay but finally succumbed on the 5th lap, Boothby’s experience showing as he passed on the exit of Mountain. I also noticed David Lamb, hotly pursued by Keith Piper in his Aston, take the perfect line though the Mountain and esses, his car and driving looking immaculate as ever. As the leader came past for the final time on the way to the flag, he slid the car beautifully round the corner before looking very light as he crested the Mountain, every inch a thoroughly deserved race winner and, I assume, winner of the Geoghegan Trophy. 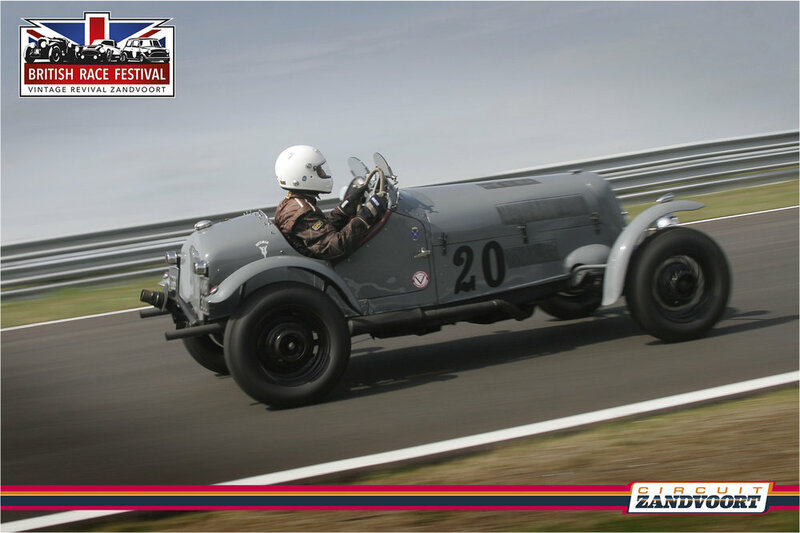 The ODM series travelled to Zandvoort in the Netherlands to take part in the 2017 British Race Festival, a celebration of British cars both competitive and on show. 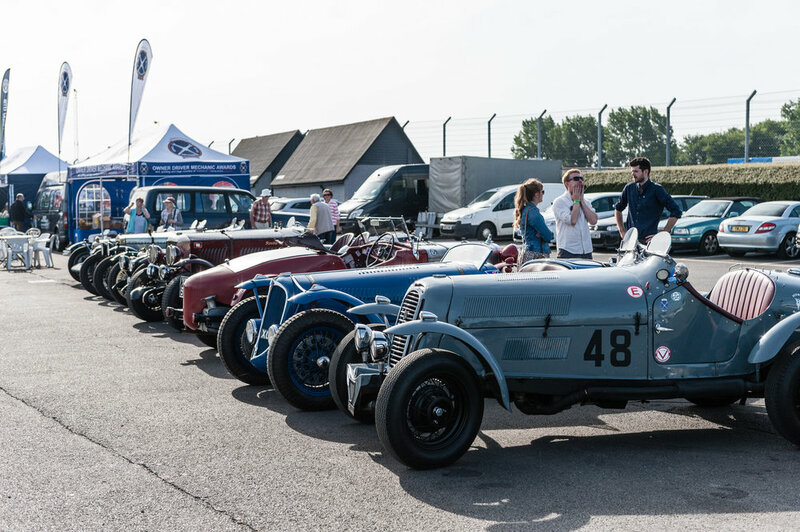 We were thoughtfully sited together with the Dutch VSCC, whose members arrived in a variety of pre-war cars to take part in parade laps over the weekend. We found several old friends amongst their number, with much to bind our interest in the weekend’s varied activities. The Zandvoort Circuit has changed little during the last 50 years, although it used to host the Dutch Grand Prix until substantial changes were requested, funds for which were not made available. The circuit retains its undulating form, flowing through the sand dunes for 2.5 miles; one competitor remarked that he had learned all the corners by the end of practice, but wondered why they appeared in the wrong order each lap……………. Scrutineering commenced on Friday with the cars agreed to be in fine form and thoroughly prepared. An unusual focus on competitors’ clothing caught some unawares; after one pair of FIA certified socks with distinctive oil stains had circulated the scrutineering bay three times, nonconforming drivers were persuaded to withdraw to the circuit shop, where a good day’s trading ensued. After an impressive thunderstorm on Friday night, the weekend proper arrived in full summer form, with no sign of standing water following the torrential rain. Qualifying took place with only minor mechanical issues becoming apparent; John Everett resolved an annoying misfire by replacing a coil and Roland Woodtli, with the support of the Riley contingent, made adjustments to the ignition timing of his Brooklands. 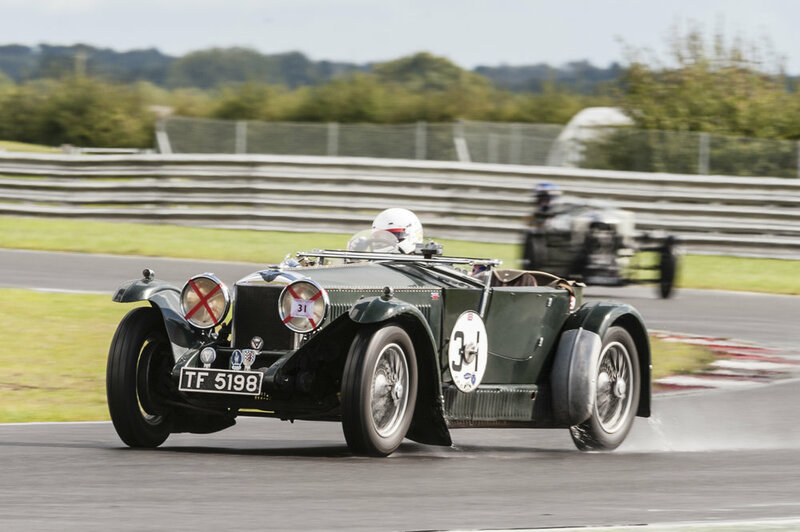 The first race saw Simon Blakeney-Edwards in the Frazer Nash lead into the banked Tarzan curve, closely tracked by Mark Brett in the Ballamy Ford and John Guyatt, in his outwardly well-behaved Talbot Lago, in close company. 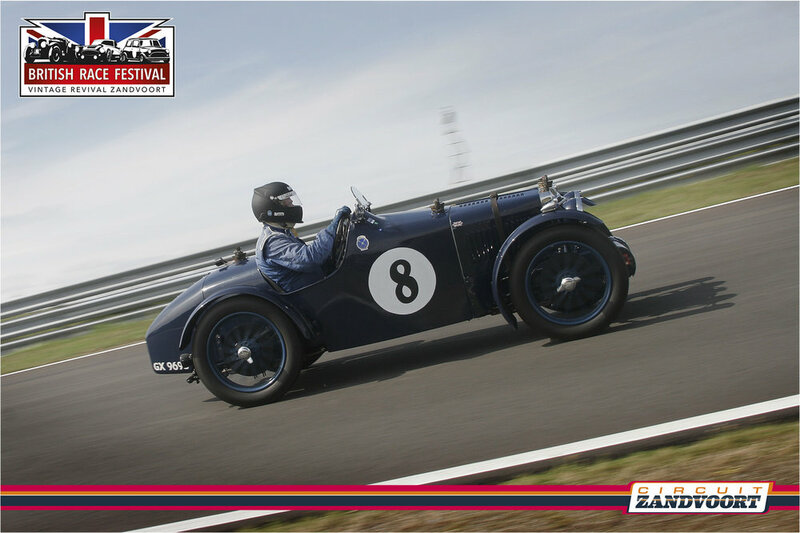 The first few positions were maintained in the second lap but by the third, Guyatt (having carried out a tyre adhesion test in the back country) slipped back down the field, being replaced in third position by Paul Waine in his Frazer Nash. On this lap and just over 13 minutes into the race, cars only appeared spasmodically on the home straight, being brought to a halt by the red flag at the start line. There was then a terminal delay whilst a racing incident at S-Bocht was dealt with and John Everett was taken to hospital with what transpired to be several broken ribs. John arrived back home before VSCC Cadwell Park and, of course, we all send him our sincere wishes for a speedy recovery and return to the ODM fold. The eight lap race on Sunday was, as may be expected, a more slightly more subdued affair but with some exciting racing seen throughout the pack. The leading trio of Blakeney-Edwards, Brett and Waine pulled steadily away from the MG P Type of Thys De Groot, maintaining these positions to the flag, Brett losing by just 0.04sec. 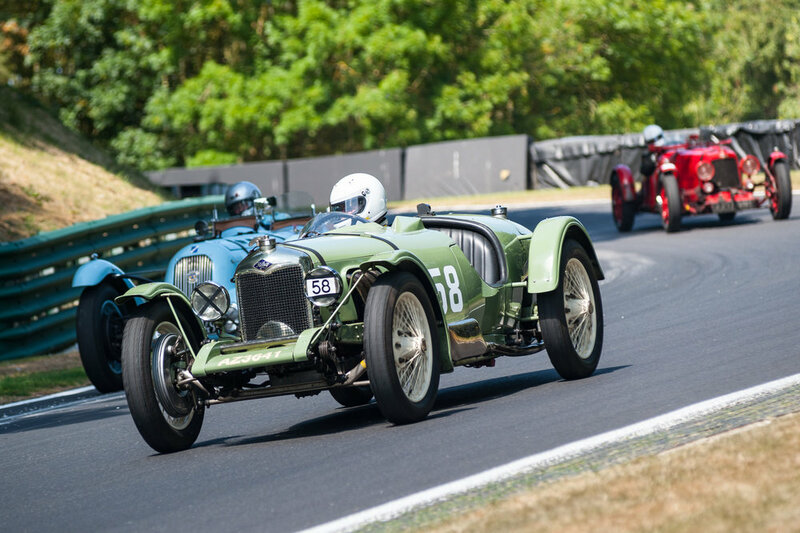 They were followed for a large part of the race by Andy Baker driving determinedly in the Brooklands Riley, the errant handling of Guyatt’s Talbot Lago ceding a power advantage until Andy was overtaken on the final lap. Further back we were entertained by close formation displays from Duncan Potter and Fred Boothby (MG Montlhery Midget / MG J2) and at the back of the field by Hamish McNinch and David Furnell (MG PA / Austin 7), Hamish following Blakeney-Edwards’ example and winning the place from David by a gnat’s whisker at a mere 0.02sec! Mid-field the Bentley TT of Richard Frankel stayed just ahead of the Alfa Romeo RL Targa of Christopher Mann, which was driven heroically from and back to London following the event. Nick Upton, who had travelled to commentate for the ODM, kindly presented a hilarious prize giving accompanied characteristically by two charming young ladies, apparently his daughters / sisters / nieces – take your choice! Simon Blakeney- Edwards and Andy Baker were jointly presented the inaugural ODM ‘Brexit Cup’ by John Guyatt, class winners’ awards going to Andy Baker, John Polson (Talbot AV105) and Mark Brett. Mechanical misdemeanors took their toll at Oulton Park, as they had at Silverstone. Let’s hope this will not be an enduring theme this season, especially with so many meetings yet to come and Zandvoort, which features two longer-duration races, next on the calendar. After a wet practice, we were blessed with a dry race. Eddie Williams, driving Charlie Gillett’s reliably well-prepared Frazer Nash Super Sport, shot off from pole position to build an unassailable lead – a little too quickly, it seems, because a 10-second jump start penalty demoted him to 2nd place in the final results. Andrew Mitchell, after a problematic practice, advanced from 5th on the grid to finish 2nd in the HRG and, though he hadn’t the pace to catch the Nash, he was promoted to 1st as a result of Eddie’s error, winning the Bill Phillips Trophy for the fourth time. Tim Kneller (Riley Sprite) ran a good race, but was disappointed to finish 3rd behind his Class rival Mitchell after having outgunned him in qualifying and started with high hopes from the front row of the grid. 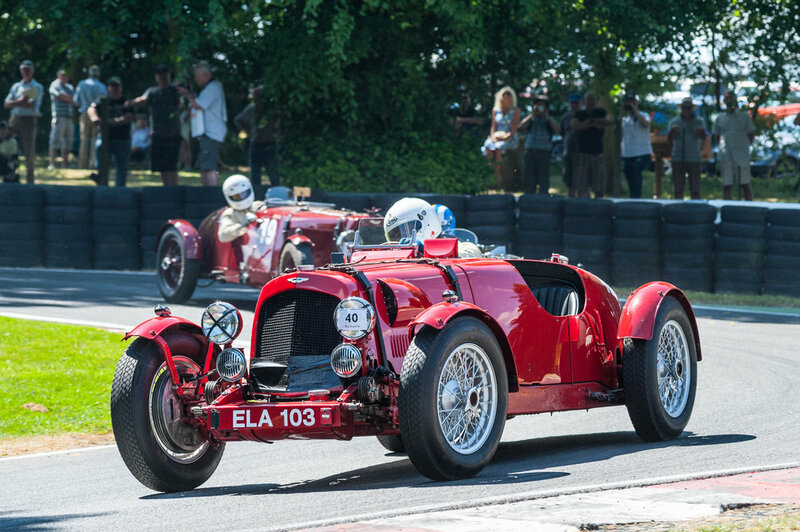 John Guyatt in the Talbot Lago gained several places at the start, overtaking Trevor Swete in the S Type Invicta and Mark Butterworth’s Lagonda, before the big V12 roared past him again and carried on to overtake Simon Blakeney-Edwards’ Frazer Nash. John held onto 6th place, constantly harried by Swete’s Invicta and Josh Sharp’s Riley Sprite until the last lap, when, slowing behind a drifting backmarker, he allowed the other two past. Trevor and Josh were delighted to finish 6th & 7th, beating John’s Talbot for the first time ever! Local man Mark Butterworth, driving one of three Lagondas in the race, finished 4th in the green V12, while Nigel Hall, also on home turf, went very well to finish 10th, narrowly beating fellow LG45 driver Richard Reay-Smith, whose monumental spin mid-race occupied a great deal of track, to the consternation of those in his wake! Ian Standing, driving Jo Collins’ agile silver Riley Brooklands (his own still residing in the workshop), was unable to capitalize on his excellent start position, lost time avoiding the spinning Lagonda, then almost pulled up with engine trouble before recovering to lead the under 1100cc cars home. Behind Ian, Freddie Smith in the beautiful Delahaye 135 had given himself a lot to do after a sensibly cautious practice placed him near the back of the grid. He managed to make up nine places, but couldn’t quite catch the similarly-paced 4-seater Morgan of Simon King, who came in 13th, the second fastest of the under 1100cc cars. Quite a number of runners complained of power loss during the race. Some finished, like Andrew Morland (MG PA): ‘got a rattle; not sure if it’s top end or bottom’ – unfortunately, it turned out to be two big ends. Others failed to finish: Anthony Fenwick-Wilson in the Railton (clutch); Simon Edwards in the Morgan Aero (mysterious malfunction, later remedied by George Darbyshire); Andy Baker (Riley Brooklands) and Jo Blakeney-Edwards (Frazer Nash), both plagued by the post-rebuild gremlins that had troubled them at Silverstone. It was particularly disappointing for Birthday Girl Jo, who had qualified 1.59 seconds faster than husband (and rival!) Simon to earn a place alongside him on the second row of the start grid. John Polson was ‘really enjoying himself’ when loud popping and banging put an end to his race, throwing his family into a pit-lane panic. John had driven the Talbot up from Suffolk the day before and was due to drive onward to the Isle of Islay the next day for a short break in Scotland with Rebecca … fortunately it was an easily fixed fueling issue! Another notable achievement in terms of reliable road mileage (and a welcome addition to the ODM grid!) came from Christopher Mann, who drove up from central London in his glorious 1924 Targo Florio Alfa on Saturday morning, competed with verve, and then drove the 93 year-old vehicle back down to London the same evening. The ODM’s ninth season got off to a flying start at Silverstone with many old faces amongst a number of new. We were delighted to welcome veteran VSCC racer Alastair Pugh in his long-cherished BMW 328 as well as Freddie Smith and Ross Keeling, both driving Delahayes, who join a growing band of sons, daughters and grandsons slipping into their father’s car seats. Edward Bradley observed (with some chagrin!) that his son Richard had bettered his lap times - but then Richard didn’t have to worry about the Aston’s repairs, seen to by Bank of Dad. It was laughingly suggested that the contribution of Dads should be recognized with a variant of an ODM Award; the OBE, ‘Owner Banker Engineers’. Yet again the ODM entry was over-capacity, so the faster Fox & Nicholl Trophy cars (over 2950cc) were in Race 1 with Set 4 and others, while the bulk of the grid ran in Race 3. In Race 1, Richard Pilkington (Talbot Lago T26 SS) used his age and experience to advantage, winning The Fox & Nicholl once again and seeing off whipper-snapper Marcus Black (son of Richard) who had briefly stolen ahead during the race and recorded a faster lap time in the T23 Talbot Lago. Mark Brett (Ballamy Ford) was always in contention, finally finishing one second behind Marcus. After missing an entire season due to engine problems, John Guyatt, aka Le Patron, was pleased to be back on the track even if he wasn’t quite in the groove. Narrowly avoiding Ross Keeling’s monumental spin (occasioned by a mechanical issue) had cost him a few places and thereafter his Talbot Lago T150C couldn’t quite keep up with his old playmates. Further down the field, Richard Reay-Smith (Lagonda LG45), Trevor Swete (S Type Invicta) and Anthony Fenwick-Wilson (Railton) had a close race, starting together on the grid. The Lagonda eventually prevailed although the Invicta showed more pace. Race 3 was certainly eventful and it was hard to keep up with all the action. Andrew Mitchell started in pole position and finished first in the HRG. (It was good to see his father Peter in much improved health.) Andrew, however, did not have a runaway lead: Tim Kneller advanced from the 3rd row of the grid to battle it out with fellow Riley Sprite owner Andy Bush. When they both sought to lap John Polson (Talbot 105) on the approach to Maggots, Andy came off worst (injured car, driver unhurt). Tim went on to finish a close 2nd behind Mitchell, recording the fastest lap of the race. Behind him, Simon Blakeney-Edwards vanquished Phil Champion in the clash of the Nashes, finishing 3rd and 4th in a good clean contest. A trio of Aston Martin Ulsters followed, led by Richard Bradley (OBE to Dad Edward?) 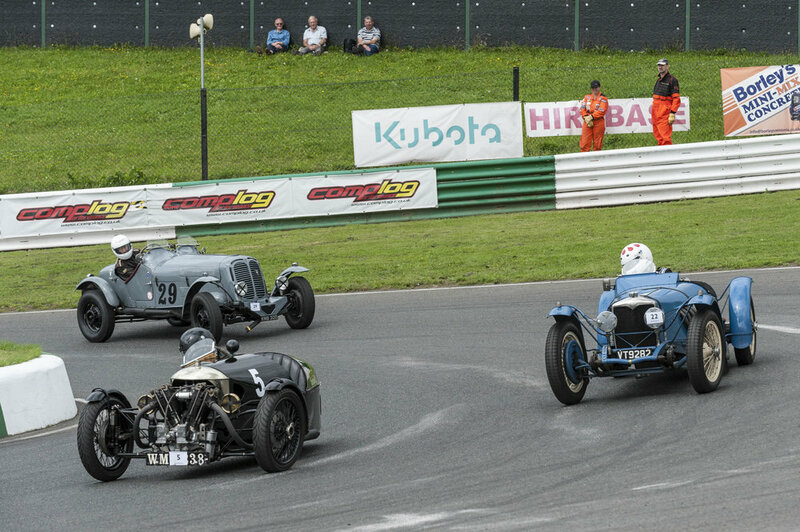 and pursued by Ralf Emmerling’s speedy and reliable Riley Brooklands. A number of contenders in this part of the field retired due to mechanical failures, including Ian Standing’s exceptionally quick Brooklands, and, sadly, Alastair Pugh in his very fast BMW, which had been circulating among the front-runners until lap 7. There was tremendous racing to be seen in the middle of the field with Nick Rossi (Alfa 1750) coming home ahead of the first group after much lively competition with Peter Bradfield’s Invicta, Chloe Mason in LM18, John Polson’s Talbot, Freddie Smith’s Delahaye and Duncan Potter’s MG Monthlery. The second group was led home by Fred Boothby who progressed steadily through the field in his MG J2, overtaking Roger Buxton’s 1750 Alfa, John Everett’s Austin 7, Geoffrey Delaney’s Hyper and Simon Jackson’s MG PB. We were treated to some excellent sport over the Silverstone weekend, despite abundant retirements, both in practice and during the races. (Never mind any thoughts of aging drivers for they are all as young as they think they are; we must remember that most of our cars are now octogenarians and sure to be a bit troublesome!) Commiserations to all who suffered with mechanical problems – we hope to see you back on track soon! Congratulations to all the finishers for their spirited drives. On a cold, windy but, thankfully, rain-free day, it was a pleasure to welcome so many new faces to the strong contingent of ODM stalwarts racing in Set 3. No fewer than 21 different marques (of various models) were represented among the 56 entries – surely a record? To accommodate the massive entry, the ODM grid was divided between two races with the Fox & Nicholl’s (over 3 litre) cars and faster smaller-capacity cars racing alongside Set 4 (where the Standard and Modifieds proved worthy adversaries amongst the Specials!). Sam Stretton was flying in the 2 litre Alta, holding onto to 2nd place overall (1st ODM) amid the jockeying front-running Specials. Mike Preston won the Fox & Nicholl’s in his 35B, thereby becoming an early leader on the ODM scoreboard. Behind him, Jonathon Turner in the glorious 8C Triumph put in a strong performance ahead of Nick Ball, driving his father’s Low Chassis Invicta, who finished a few hundredths of a second in front of Mark Brett’s Ballamy Ford. Further down the field, Richard Wilson in the rare and beautiful Squire ran a close race with Christopher Lunn in the Talbot 105, both just beaten by Paul Chase-Gardener’s Aston 15/98, who thus topped the ODM scoreboard in the 1501cc – 3000cc Class. Fuelling problems put Norman Pemberton out of the race and prevented a distracted Trevor Swete (in one of the three S Type Invictas) from starting … I’ll say no more! The morning practice session had seen a number of retirements due to start-of-season mechanical troubles, but nevertheless an impressive field roared off the line for the second ODM race led by Jo Blakeney-Edwards (driving husband Simon’s Frazer Nash), hotly pursued by Mark Groves and Phil Champion (both in Nashes) and Andy Bush in the Riley TT rep. Groves briefly took the lead as Blakeney-Edwards lost pace under yellow flags, but Jo soon regained it closely followed by Bush from Champion and Groves; Bush then lost second place to Champion as his car slowed with an impending piston failure that put him out of the race. Jo Blakeney-Edwards held the lead to the end with Phil Champion (top of the 1101cc – 1500cc Class on ODM points) and Mark Groves completing a Frazer Nash 1-2-3. Adrian van der Kroft, one of several overseas competitors, found impressive speed in the Morgan 4/4 to take 4th place, comfortably holding off Ralf Emmerling, who had worked his way from the back of the grid to finish a creditable 5th in his Riley Brooklands just ahead of Chloe Mason in the Aston Ulster LM 18. Behind them, Nick Rossi, in the fastest of the three 6C Alfas, saw off another Aston Martin Ulster (driven by John Briggs) but was pipped to the post by Fred Boothby’s J2 by a mere 10 hundredths of a second. Duncan Potter, finishing 10th in his MG Midget, gained just enough ODM points (15) to take the lead in the Under 1100cc Class ahead of Adrian (with 14) and Ralf (13). Further down the field, equally close contests were played out by ODM veterans Cyril Hancock in the Fiat Balilla and Keith Piper in the Aston Martin International, who finished just 8/100ths apart, and regular rivals Tim Wadsworth (2 litre Lagonda) and Alex Pilkington in her 1750 Alfa. All in all, it was an entertaining day’s racing, enjoyed by old hands, new faces and enthusiastic novices; spectators such as myself; and the frequenter of the ODM hospitality tent who admitted 'this is what I really come for – the racing is just what I do in-between!' … I’ll mention no names! A very wet morning left competitors looking for grip in practice, but a brisk wind dried the 2.692 mile International Circuit for the afternoon’s race. As the flag dropped, Mike Preston’s Bugatti T35B stormed into the lead from the second row, overtaking pole-man Andrew Mitchell in the 1½ litre HRG and Sue Darbyshire, always a slower starter with only one driven wheel in the Morgan Super Aero. By the second lap, the three leaders had pulled away with little between them, followed by Mark Butterworth in the Lagonda V12 in 4th, Trevor Swete in the Invicta S Type in 5th and the two evenly matched Frazer Nashes of Simon Blakeney-Edwards and Mark Groves in hot pursuit. Mark Brett in the Ballamy Ford had already charged through the field into 8th from 16th on the grid after 'a terrible, terrible practice'. A consistent Hamish Monro held 9th in the Frazer Nash SS and Andy Bush recorded his fastest lap in the Riley TT rep to climb to 10th place from a start position of 20th, before losing pace due to a misfire. David Johnson followed in the Frazer Nash Colmore with James Potter, lead driver of 5 Brooklands Rileys, steadily pulling away from Mark Dolton in the MG PB. Newcomer Edward Williams in the Austin 7 Ulster retired with a suspected slipping clutch, (which Coca-Cola, hastily gleaned from the hospitality tent, had failed to remedy … I believe the problem lay elsewhere!). As the race developed, Mitchell made a convincing pass into Old Hall to take 2nd place from Sue Darbyshire 'baulked by backmarkers'; Brett worked his way up to 5th but couldn’t find a way past Butterworth’s vast V12 despite circulating faster; Blakeney-Edwards and Groves exchanged places a couple of times eventually finishing 6th and 7th; Potter overtook Bush and Fred Boothby in the MG J2 to finish 10th; Nick Rossi (Alfa 1750) tailed by John Briggs (Aston Martin Ulster) made sterling progress up the field, narrowly beating Duncan Potter in the MG Midget; and Andy Baker steadily advanced through the pack at the back to finish at the head of the other Brooklands Rileys. Mike Preston was the undisputed winner, leading from start to finish and adding the Bill Phillips Trophy to the Fox & Nicholl’s bagged at April Silverstone. This cements his lead on the ODM scoreboard as frontrunner in the Over 3 Litre Class. James Potter gained most points in the Under 1100cc Class, propelling him into 2nd place on Aggregate behind Duncan Potter, with Andy Baker a close 3rd. In the 1101cc – 1500cc Class, Andrew Mitchell took the honours, placing him 3rd on Aggregate behind close rivals Simon Blakeney-Edwards and Mark Groves. Nick Rossi’s achievement moves him to the top of the 1501cc – 3000cc Class. 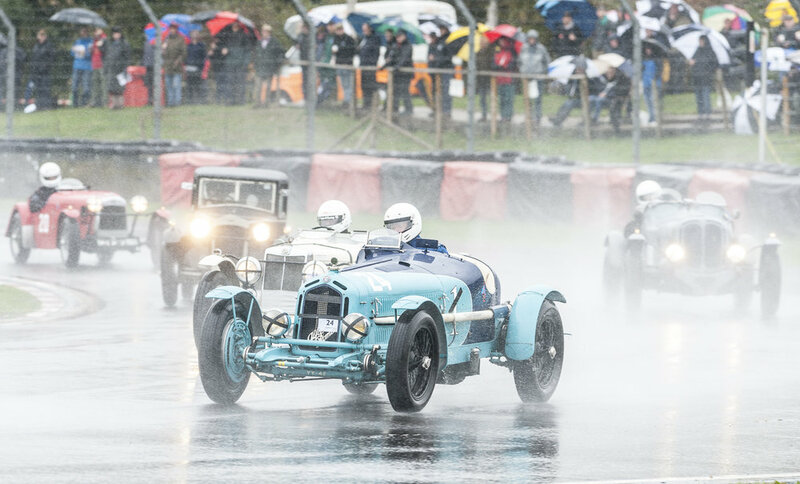 From a wet start to a fine finish, the International Circuit at Oulton Park proved to be a challenging and rewarding experience. Well done to all … and particular congratulations go to two veteran ODM enthusiasts, Cyril Hancock and Norman Pemberton, who were cheered into the hospitality tent after finishing 1st and 2nd in the All-Comer’s Handicap later in the day. One of the (many) unwritten rules of the ODM series is that when John Guyatt asks you to do something you can usually find a way of palming it off on someone else. But if Lesley says ‘Jump’, the only sensible response is ‘Of course. How high?’ So it was that I found myself given the task of reporting on the Set 3 race at Cadwell. Now my experience of reporting motor racing is limited to my usual reply to enquiries at the end of the race: ‘Where did you come?’ – ‘Dunno – somewhere near the back’. So I asked Lesley for some guidance. ‘Oh its easy,’ came the reply, ‘you know all the people and the cars so just describe what you see.’ It was at that point (far too late) that I realised, not for the first time, that someone had far more confidence in my knowledge and ability that was, strictly speaking, justified. Still, I had built a reasonably successful military career on this basis, so it was too late to worry. The truth is that I recognize about half of the Set 3 drivers and can remember the names of about 10% of them on a good day. And the cars I divide into 3 groups: MGs, not MGs and The Bellamy Ford. Things got worse when I had a look at 2 previous reports – clearly written by someone who not only knew about the cars and drivers but had also managed to fathom out what was going on throughout the race and had recorded it accurately. One tip Lesley had passed on was to go to the assembly area and chat to the competitors. I was somewhat nervous of this idea because anyone who attempts to talk to me in the Assembly area gets short shrift. But Anthony Fenwick-Wilson was happy to share the fact that his car had arrived late because the transporter had broken down, his computer had packed up the previous day and both he and his wife’s mobile phones had gone on the blink – safe to say he wasn't optimistic about finishing. I told him not to worry as I had already drafted my race report and had him down for a podium…. which proved to be extraordinarily prescient as he did indeed mount the podium later in the day, although not in this race. Then the signal to saddle up was given and my first, and possibly last, grid walk ended, having interviewed 4% of the competitors. And, sadly, there was no sign of the Bellamy-Ford, thus reducing my options for accurate car recognition still further. Much to my surprise, I was just able to see the start line and note that Mahany, on pole in a ‘not MG’ was jumped by Williams in the Nash and Preston in the Bugatti, with Mitchell (in another ‘not MG’) in hot pursuit. And then they all disappeared from view up Coppice. Or so I thought…. About 10 seconds after the last car disappeared from view another one stormed off the line in hot pursuit. It was the Talbot-Lago. I could only surmise that it had returned to the assembly area, rather than the paddock, and had been allowed to start from there. Interesting. As the main race arrived at the top of The Mountain, Mahany had pulled up to second and was now engaged in what was to be a 3 lap battle to re-take the lead. Behind the leading group the remainder of the field streamed by in quick succession, causing the commentator to remark that it resembled ‘the last lap of a good handicap’. He was right. The middle of the field was, and remained, extremely tight throughout the race and presented a fine spectacle – proving once again that Cadwell is well suited to our cars and stimulates close racing even among cars (and drivers) of such varied performance. I noticed that the Talbot-Lago had again left the circuit on the paddock return road and I wondered whether Black had decided, from his previous experience, that the route through the assembly area was actually quicker than going up The Mountain. Would he do this on every lap? Sadly, this turned out not to be the case and we had seen the last of him. Further back, Cadman in an MG went past Lamb in ‘Mephistopheles’ as they crested the Mountain and set off in pursuit of Hancock in the Fiat. As they came round on Lap 2 the order of the leading pack was much the same except that Groves in the Nash had moved up from 7th to 6th as a result of Bush’s withdrawal and Briggs in the Aston had gained a couple of places. The next lap saw Mahany make his move. Having presumably exhausted all the available options for overtaking Williams on the track, he decided to try the grass route and popped out at the top of the rise in a lead he was to hold for the rest of the race, his only apparent difficulty being getting past Runnels-Moss in the Vauxhall on the last lap. Behind Mahany and Preston in the Bugatti, Lake, Groves and Waine, in that order, were locked in a close fight, which was destined to continue throughout the race, with Groves eventually succeeding in getting past to take 5th. Everybody else seemed to be happily engaged in their own races, with special mention of Simon Edwards in the Morgan who worked his way up the field to 12th with a typical spirited Morgan drive. Mahany both won and just pipped Edwards in the Nash to fastest lap by a single hundredth of a second. The commentators also awarded Mahany with the Geoghegan Trophy, but of course WE knew that his HRG is far too modern for that. Most appropriately it went to Williams in the Nash. Duncan Potter took the handicap award in an MG…. For those who ventured to the Wild West, weather-torn Wales afforded challenges and amusement in equal measure. Hurricane-force winds and squally rain on Friday night proved too much for many campers – most wisely decamped to local hostelries or took refuge in their cars. Louise and Mike Preston, however, displayed admirable resilience and slept in their tent nonetheless … ‘we could weigh it down quite nicely’ Louise giggled. (She enjoyed sharing a drive in Mike’s Bugatti at Saturday’s Sprint Meeting – naturally NOT beating the boss, who won his class). In view of the weather, the ODM marquee also remained safely under wraps until the winds abated on Sunday’s Race Day … but it furnished a welcome refuge from the rain, which returned later. The morning practice was dry but saw two unfortunate retirements: Richard Bradford’s Riley ‘making a horrible noise’ (again!) and Sue Darbyshire’s Morgan, suffering from oil starvation (all the more disappointing because of the supreme effort she and George had made to join our grid after the ‘racing’ Morgan developed an elusive problem during Saturday’s Team Race). Also absent was Andrew Baker’s Brooklands, which brother James had wisely retired from the Team Race before the oil pressure declined to critical. Nevertheless, a grid of 20 roared off to open Sunday’s Race Programme with Tim Kneller on pole. Tim’s Riley Sprite circulated exceptionally quickly (‘well, that’s the idea, isn’t it?’) and led the race from start to finish. Mike Preston jumped a row at the start to move into 2nd place, which he held to the end in his Type 35B, ahead of Mark Brett’s Ballamy Ford in 3rd. Behind the front-runners, the well-matched Nashes of Mark Groves and Simon Blakeney-Edwards entertained us constantly (how many times did they overtake each other? – ‘about a hundred!’ thought Mark). Hot on their heels, Ian Standing kept looking for an opportunity to nip past in his Brooklands Riley… although he couldn’t find a gap, he said that it was the best race he’d ever had with the VSCC. At the rear of this group, Duncan Potter hurtled round in his little MG Midget, increasing in speed as his fuel load diminished. Further contests played out down the field: Fred Boothby gaining ground in the MG J2 and Keith Piper in the Aston Martin International pipping the P-Type Lea Francis of David Johnson by a whisker. Andrew Morland had an unexpected spin in his MG PA just after the last corner of the penultimate lap and limped over the line behind the finishers. We wondered why he had spun when the track provided such good (all-weather!) grip; he’d had a puncture. As always, the Welsh Speed Weekend was an unforgettable experience … and before you remark how far away Pembrey is, spare a thought for John Everett, who lives even further west and still regularly brings his Austin 7 all the way to England’s most easterly circuits in order to race with us! 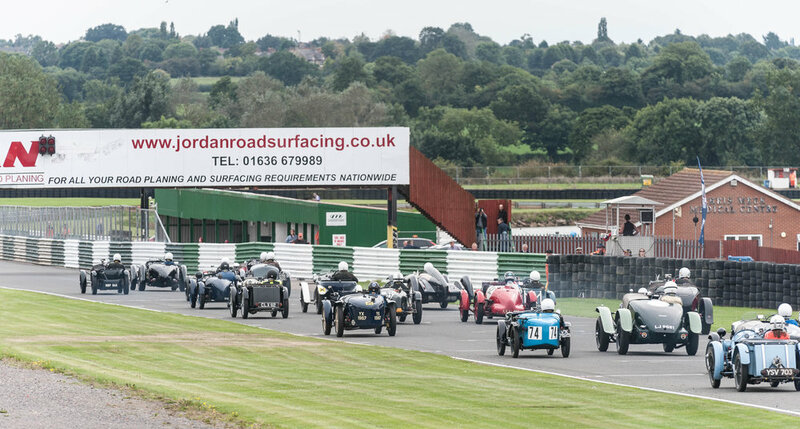 In a fitting end to the VSCC ODM season, the sun shone on Mallory Park as the competitors took to the grid for what would prove to be a thrilling finale. Andrew Mitchell put his highly successful HRG on pole position closely followed by Marcus Black’s Talbot Lago. 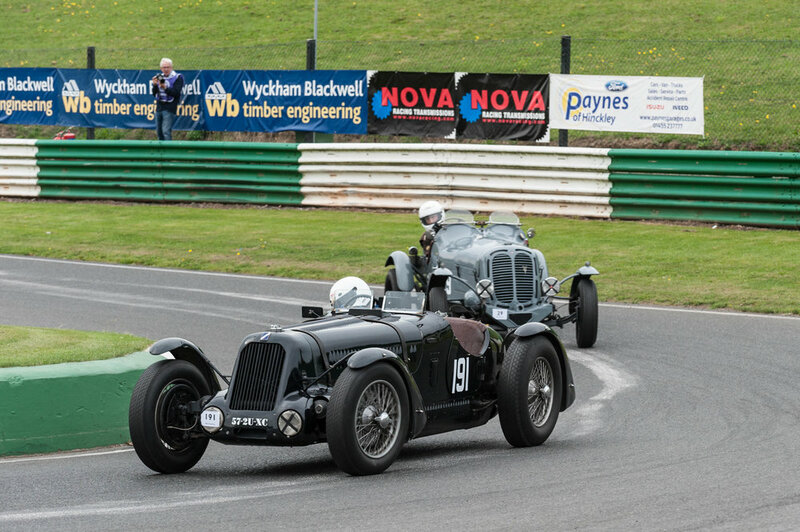 The second row of the grid was occupied by Mark Brett in the Ballamy Ford and Simon Blakeney-Edwards in the Frazer Nash. As the flag fell, Mitchell was overcome and it was Black that took an early lead, closely followed by Blakeney-Edwards, and the positions held true for several laps. Mitchell made several attempts to regain his place and finally managed to overtake on the approach to the infamous Shaw’s Hairpin. Meanwhile back in the pack, regular competitors were having a difficult time, including David Lamb in the Riley Brooklands, who first suffered a misfire caused by a water leak and then a spin owing to the same problem. MG regular Mark Dolton was forced to retire after a fellow competitor’s car doused him with petrol. An undoubted highlight was Steve Smith’s giant Hotchkiss AM80, which entertained the crowd keeping up with much smaller and more nimble cars, and certainly gave many a thrill watching him negotiate the hairpin. He eventually finished two places ahead of his qualifying position. Back at the front the race was all about the HRG which pulled out a comfortable lead, eventually taking the win. Black and Brett were hot on his heels, determined not to let Mitchell have it all his own way, and enjoying excellent battles whilst giving chase to the fleeing red machine. Blakeney-Edwards proved the nimble Frazer Nash was more than a match for Smith’s Hotchkiss and the pair finished fourth and fifth respectively. Mark Groves in the other Frazer Nash followed them home in sixth, with Ralf Emmerling finishing seventh just pipping fellow Riley Brooklands driver Ian Standing to the flag. An acquaintance approached Hamish McNinch after the flag, enthusing about our race ‘…..and that grey car’ he said ‘what was it, the Blimey Ford?’ As it’s the only car other than an MG that Hamish recognises, we hope he was able to put the fellow right! 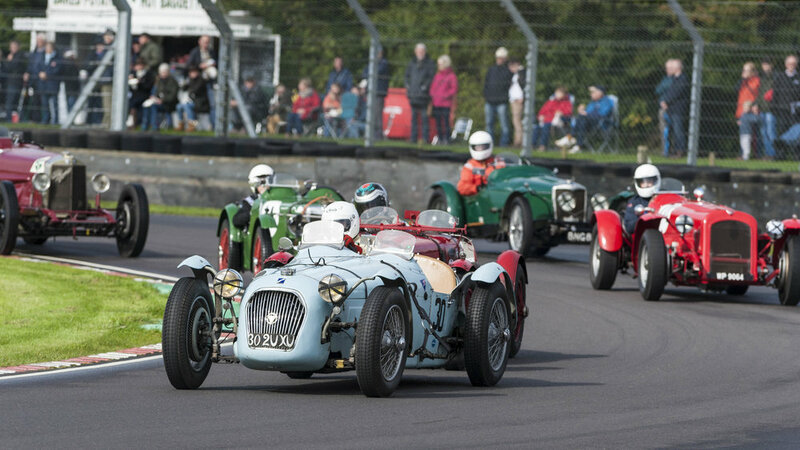 The Castle Combe Autumn Classic provides an end of term celebration for the VSCC, indeed a showcase of our racing spirit, the variety of historic vehicles and racing for fun in itself. Qualifying was endured in the rain by all with the exception of course of Owlet, who excelled under the skilled guidance of Patrick Blakeney-Edwards to secure pole position with, as ever, a broad grin. Sam Stretton took second place in the immensely sharp Alta Sports, followed by the ever competitive Mark Gillies and Andrew Mitchell, respectively in the Aston Martin Monoposto and the Meadows 1.5 HRG. Simon Diffey had secured an invitation to drive the team Aston Martin Ulster, expertly fettled by the Bertelli magicians, and put the car in fifth position. An excellent lunch was, as ever, provided by John Guyatt and Lesley under the marquee of the Owner Driver Mechanics banner, hospitality given with warmth, a vast variety of delicious cheeses, biscuits, meats and an endless supply of hot drinks. It also made a welcome shelter when the odd but substantial autumn splashes concentrated their water power onto the circuit. Owlet's wishes for a wet race failed to materialise; strong sunshine enabled the power of the Alta, under the guidance of Stretton, to beat the pack to secure first place, recording a best lap of 1.30.92. Mark Brett in the Ballamy Ford accelerated sharply from eighth place on the grid, obtaining sufficient grip to place him into fourth position, held momentarily until the power of Gillies and Diffey collected second and third places to secure their original grid positions. Owlet was wagging his two rear eyes at the opposition, but by the end of the first circuit was in third place, surrounded by the two Astons; Stretton by then was enjoying his own race ahead. The race was for 20 minutes’ duration, during which we saw Diffey pit momentarily to alter settings, Barry Foster (MG) stop to water both car and driver, and one retirement from Yushan Ng (Frazer Nash). This was most unfortunately before the race began, which was extremely disappointing as he had secured seventh place on the grid; as ever, a broad smile from this young gentleman and enormous resilience. Other non-classified drivers were David Cooksey in the Bean on lap 9 and Barry Foster in the MG 18/80 on lap 8. Stretton was circulating swiftly to the point where he lapped a number of cars, recording a best lap of 71.61mph. Owlet and Mark Brett enjoyed a short battle; this clearly encouraged Owlet to attack Andrew Mitchell, the difference being only 1.88 seconds at the end. Maybe an extra lap would have altered the results? 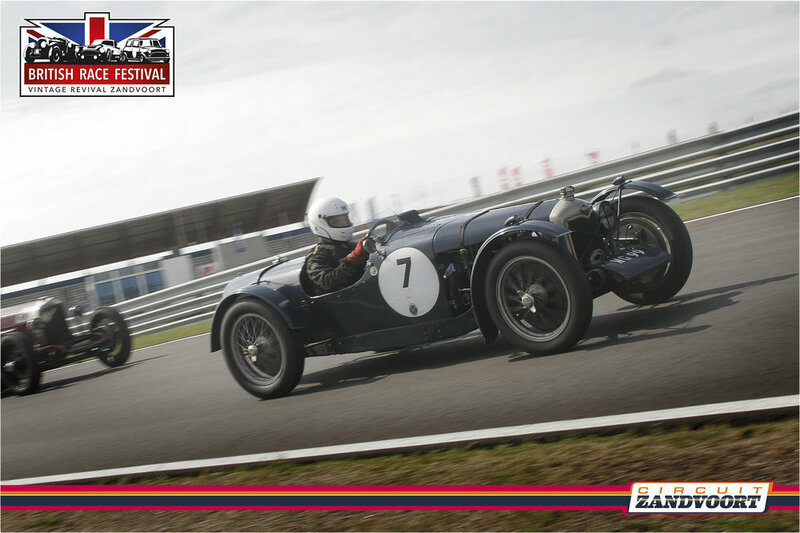 Simon Edwards was the only Morgan Aero, but as ever produced a fast lap of 62.56mph, securing eighth place.